Price Drop: Take advantage of recent discounts on this item while you can! Supports Umbrellas up to 45"
This Bolt Umbrella Mounting Kit is designed to allow for the use of umbrellas up to 45" on a VB-series bare-bulb flash unit. It works with shafts up to 8mm thick and features a wide angle reflector with a pass-through mounting hole for ensuring the light will completely fill larger umbrellas. 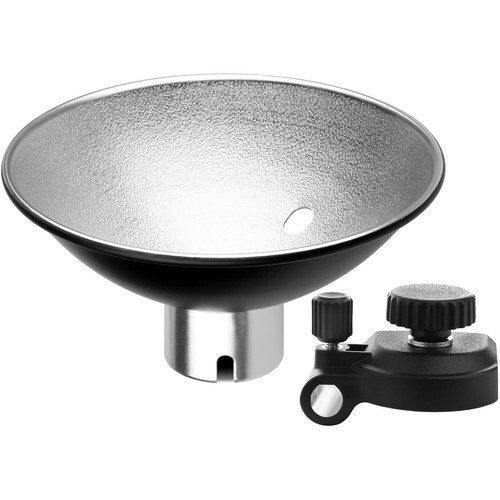 Additionally, the umbrella bracket attaches easily and securely with a thumb screw on the flash head. Box Dimensions (LxWxH) 5.6 x 5.6 x 2.7"
Umbrella Mounting Kit for VB-Series Bare-Bulb Flashes is rated 5.0 out of 5 by 6. Rated 5 out of 5 by Ian from Elegant secure umbrella mounting to portable flash Simple and quick setup. Very secure mounting on the flash with minimum flexing of the bracket or flash unit when a small umbrella is mounted. The bracket may be left permanently attached without adding too much bulk to the flash. Rated 5 out of 5 by Paul J. from Umbrella mount kit I put the adapter on the flash and leave on in I want to use a small umbrella. The reflector is a bit soft and wide spread for umbrella use. Rated 5 out of 5 by Vince from Simple and effective I just leave the little umbrella bracket on the flash unit all the time, and it is just a simple action to replace the reflector. Rated 5 out of 5 by JZ from Wonderful item If you have umbrella mount you will need this. It does the job well. Rated 5 out of 5 by CANDEX from I would buy this product again. So far this product works very well.